I am fortunate to have a devoted friend to share in the next phase of my life. She is gentle, loving, and loyal. She offers warmth and kindness to everyone she meets. She is my beautiful service dog, Aria. 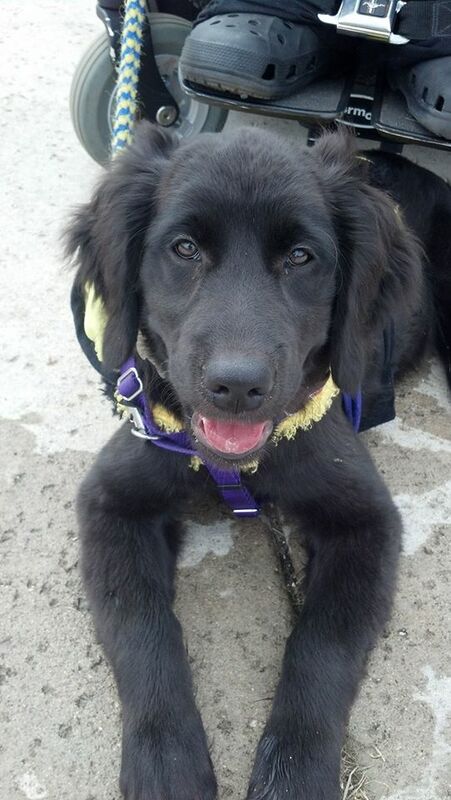 Aria is a golden retriever and 1/8 standard poodle. She was born on July 1, 2013, to Kira and Baloo, who are owned by Sandy and Joy, longtime friends of my assistant Chrissy. She was the last puppy born, and almost didn’t make it, but she’s a strong little girl who I believe was put on this earth to do something special. 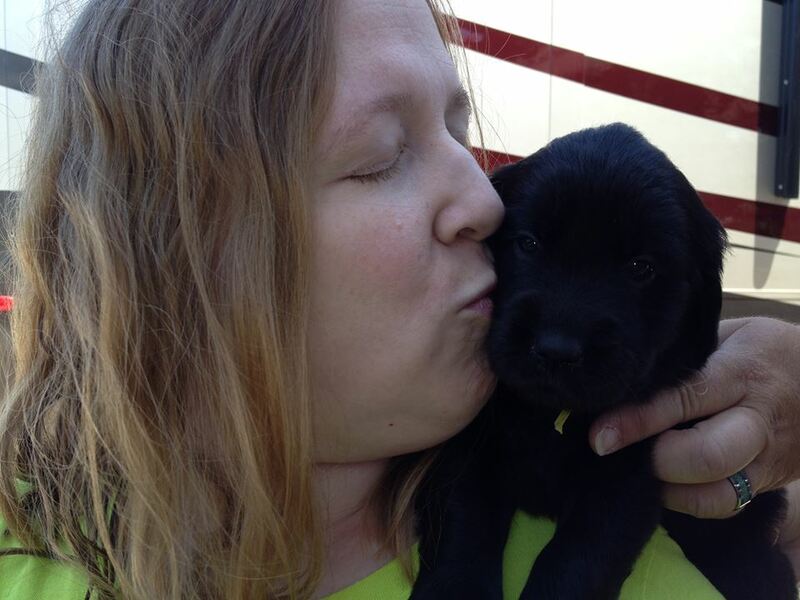 From the moment my life became my own again, I knew I wanted to have another service dog. 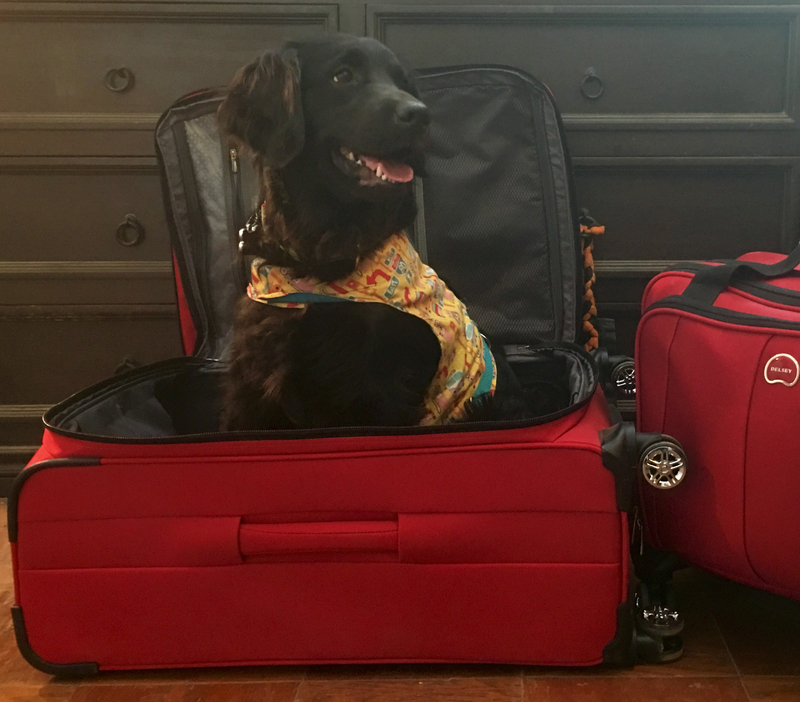 Having a dog gave me the courage and ability to move across the country by myself, to go to college, to live on my own in LA, and go wherever I wanted, whenever I wanted, and feel safe. After being trapped at home most of the time for years, I was ready to get out in the world, reconnect with people, and go places on my own again. When at home alone, I needed the safety of having a dog who could retrieve things I drop, open doors, and turn lights on and off. I still battle panic attacks as a result of what I went through, and I hoped for a dog who would intuitively respond in the way I needed. I first met Aria when she was five weeks old, and I hadn’t decided yet whether I was ready to get a puppy. I heard about the unexpected litter via Chrissy, and wanted to learn more and meet the parents of the puppies. Kira came from excellent lines, and has done lots of therapy work as well as dog sports, so I was optimistic that they would be great puppies. 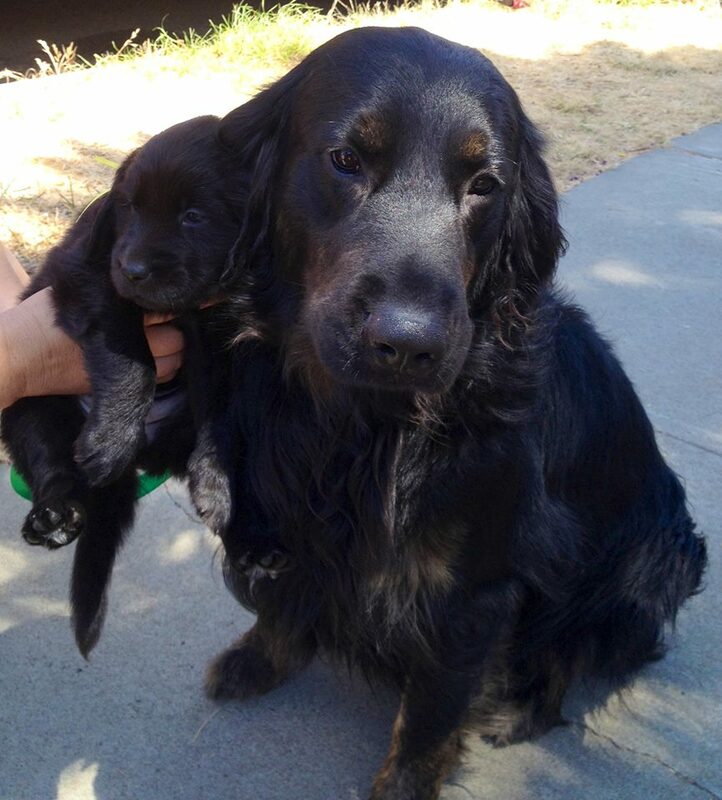 There were six gold and four black puppies born, and by the time I heard about them all of the gold ones were spoken for. That was ok, I preferred one of the black, and although I originally wanted a boy, Sandy said that one of the girls seemed perfect for my needs. She was the one with the little yellow ribbon, and from the moment I saw her, I adored her. I went back to visit a few times, watching her personality emerge. She was gentle and mellow, a bit whiny at times because she missed her mom, but I figured she would attach to me right away, and she did. When she was eight weeks old I brought her home. I set up a harness and seatbelt on the back couch, but she wanted to be with me and screamed all the way home. I didn’t feel it was safe to hold her because I worried she would slip out of my arms and get stuck somewhere, or crawl under the gas pedal. The moment I got her home, I held her, and then it was time for introductions to the rest of the furry family. At the time, I had six other dogs, but had recently learned the terrible news that one of my cavalier King Charles spaniels, Sammy, had a brain tumor. It had grown so large that treatment was hopeless and I opted for comfort care, but he surprised everyone, living for six precious months after his diagnosis. I finally had to let him go in February 2014, when Aria was seven months old. She carries the middle name Samantha in his honor. My other dogs are Arthur, a loyal, elderly springer spaniel mix whom I tried to train as a service dog many years ago, but ultimately he wasn’t good in many situations because he dislikes dogs he doesn’t know (as well as most dogs he does know); Elphaba, a high-energy chocolate lab who desperately needed a play buddy; Fiyero, a neurotic Chihuahua mix; Adele, an adorable shih tzu, whom I apparently named after the wrong singer because she loves to twerk; and Charlie, a Cavalier King Charles spaniel who grew up in the same first home as Sammy, and was his best friend. All of my dogs aside from Aria are rescues from the shelter, street, or a previous home that could not care for them. None of the dogs were thrilled at first that I had brought home a wiggling, unmannered little monster, but they gradually grew to accept her. 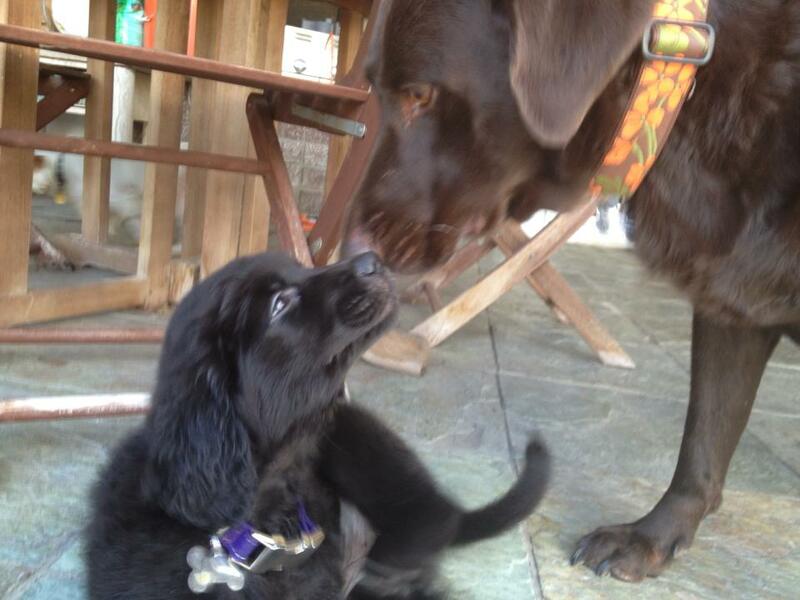 Elphaba and Aria became the best of friends, and Elphaba has been a great mentor, teaching Aria how to retrieve. Aria proved to be a quick learner and was potty trained the first week. I started taking her to the outdoor mall the second week. I believe that early socialization and training is worth the small risk of disease prior to completing vaccinations. In Aria’s case, it saved her ability to become a service dog, as she was a bit fearful at first, but the early exposure helped her develop resiliency, and taught her that I would keep her safe. Her fear of drainage grates, shopping carts, and loud trucks quickly faded as I got her used to the sounds she would hear in the world. Although she can still sometimes be a bit sound sensitive, she responds to encouragement rather than shutting down, because I gave her the tools to do so. I train Aria using positive reinforcement, with a method called clicker training. You can read more about clicker training in my post Clicker Training 101, but in summary, it is a humane method of training that uses rewards to teach dogs and give them a love of learning. 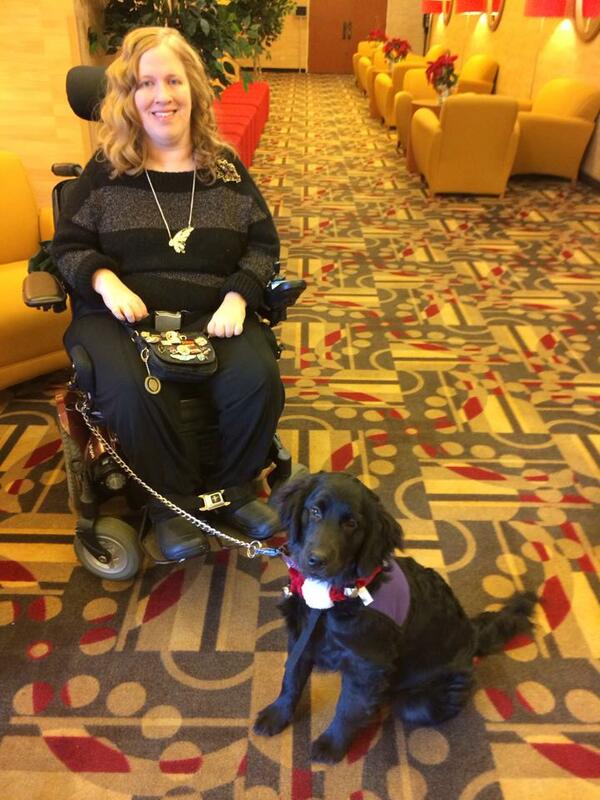 I don’t believe in using harsh methods to train any dog, whether a service dog or family pet. Devices such as shock callers and choke chains are harmful and do nothing to teach dogs what is right and good – they teach only fear. 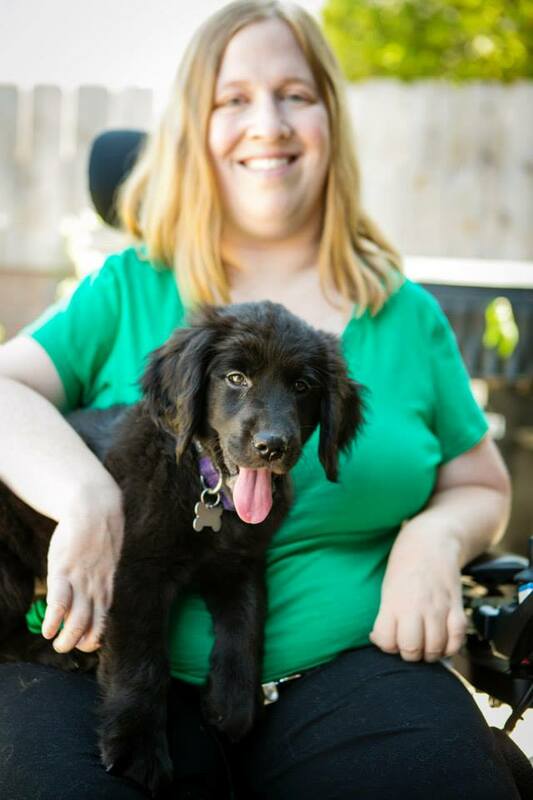 Aria has been trained with love, and it shows in her joyful attitude towards life. Aria’s skills and abilities continue to grow each day, and she is developing into a wonderful service dog with a great capacity to love. So far she can turn lights on and off, open and close doors, open drawers, and is learning to retrieve items that aren’t toys. She runs to my side when I have a panic attack, and if it happens late at night, she jumps on the bed and lays against me with her paw on my chest. She goes just about everywhere with me, and loves meeting new people, especially children. I am truly blessed to have this furry being in my life, and look forward to many years of adventures with her by my side.